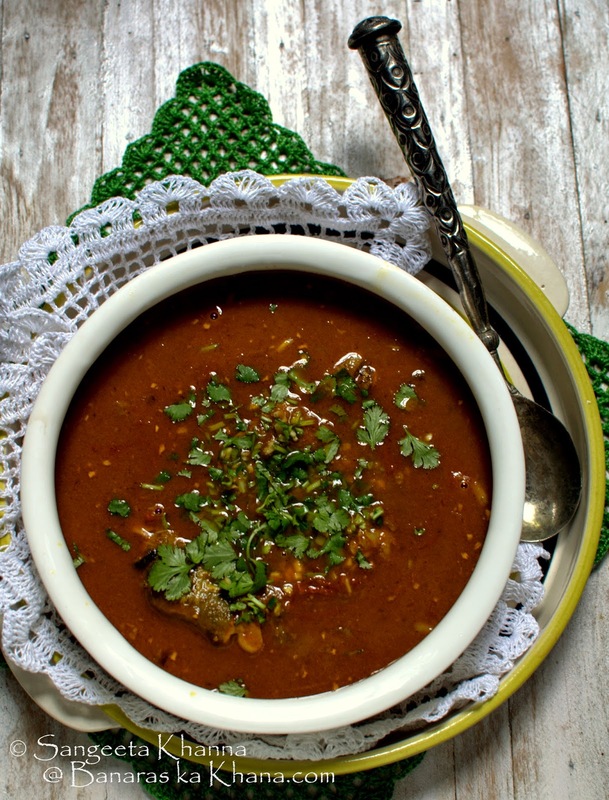 Paya shorba is nothing but a stew cooked with lamb trotters or goat trotters. This is the best bone broth that is simmered with some spices to make a gravy or shorba that tastes rich and is very healthy too. It is well known that bone broth is a healing supplement to diet and new mothers and recovering patients are advised to have it every week or so. 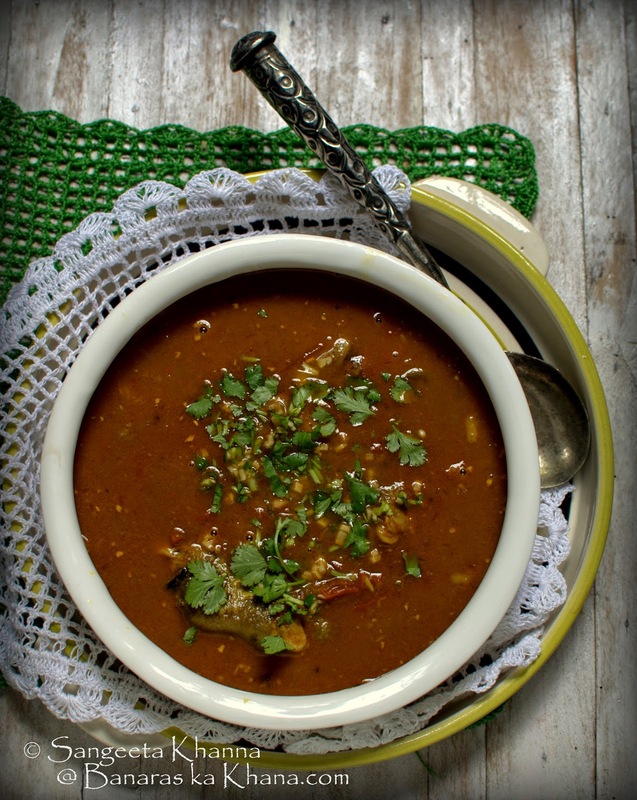 This paya shorba is an Indian version of the same bone broth and is cooked differently in different parts of the country. In the early days of my cooking I had tried this stewed trotters but somehow the smell discouraged me and I could not eat the stuff. I liked it if someone else cooked or when we ate at purani dilli markets. Recently we saw paya shorba being sold very cheap near Charminar area of Hyderabad. People would buy a huge pack of paya shorba and a few yeasted flat breads and take it home. Curiosity got the better of me and I bought the same along with some biryani and brought back to our guest house. These single portions were so huge we could not finish even the half of those. But the taste was so good we still remember the aroma and the deep rich comforting experience. We were talking about how one can buy this stuff and make a green curry make a cheap affordable yet nourishing meal. I am talking about Shadab Biryani shop close to Charminar in Hyderabad. 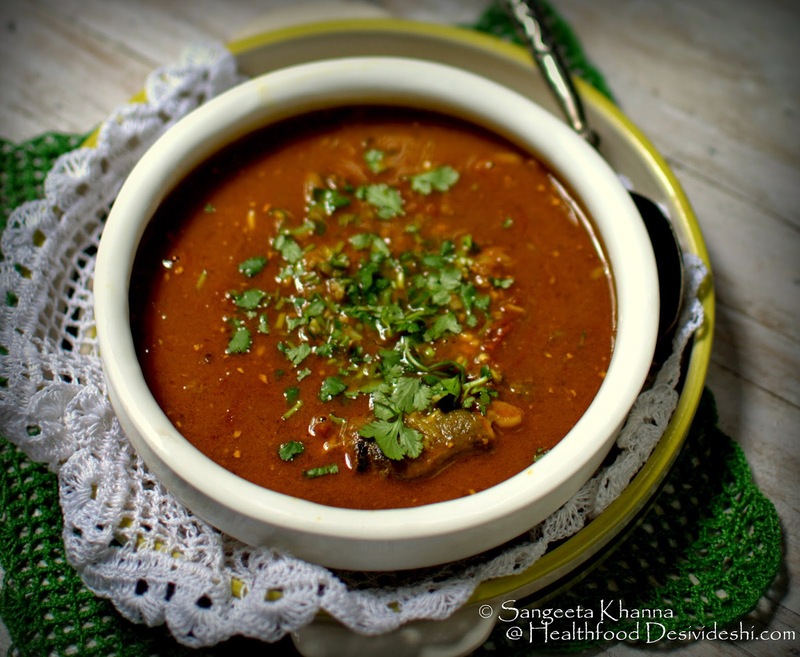 I wanted to recreate the same taste but did not want to grind a lot of spices so I searched for a simpler recipe and found one on a Pakistani blog. I usually remember even the new blogs but somehow later all these blogs started looking similar when I searched for the same recipe at the time of cooking. Thankfully the basics were already in my head and the shorba that came out was exactly the way I had wanted it to be. The most important step in making the paya shorba is cooking it really for long hours or under pressure so the gelatin extracts well from the bones and comes into the broth. Cleaning the paya (the trotters) is another tricky business if they come with the hairy skin attached. It needs to be burned carefully and rinsed well but I prefer getting cleaned trotters from the butcher. Another hassle is that the place where I order my meat and chicken from, doesn't stock trotters so we just get them whenever we have time to go and pick up trotters from a traditional butcher and then to cook them for hours. A rare treat but we are trying to do it as frequently as possible. Rinse the trotters well and pressure cook for about 2 hrs along with the ingredients listed. Two hours pressure cooking seems too much but helps in extracting the gelatin from the bones really well, the bones become soft and crumbly. If cooking in a pan you need to replenish water repeatedly and cook for about 5-6 hours. Let the pressure cooker cool down before proceeding. Fish out the trotters and keep aside. Strain the broth and discard the whole spices. To prepare the bhuna masala, heat the oil in a deep pan or kadhai, tip in the sliced onions and fry them on medium flame till browned well. Drain and keep aside. Now make a paste of coriander seeds, cumin and black peppercorns, cardamom, turmeric, ginger and dry red chillies together with 2 tbsp water. Empty the wet masala paste into the remaining oil and fry on medium flame till aromatic and glazed. In the same blender add chopped tomatoes or yogurt if using and make a paste. This will be added into the glazed bhuna masala. Cook and little more till everything becomes aromatic again. Tomatoes will result in a vibrant colour while yogurt gravy will be lighter in colour. Now blend the fried onions in the same blender and add to the bhuna masala, mix well and now pour the trotters and the broth, grate nutmeg over it and simmer for about half an hour. Add water if required. This is one dish that doesn't cook in a hurry. Some fat will float up when it is cooked. 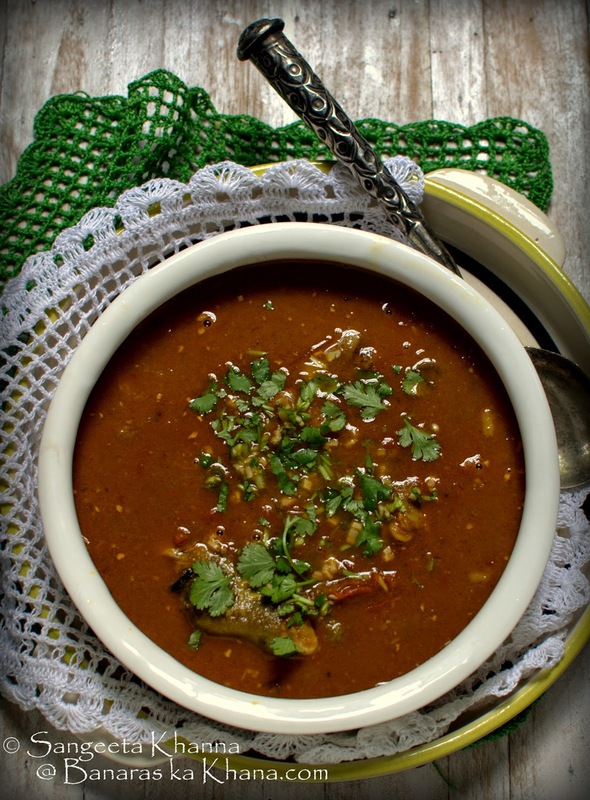 Serve hot with a garnish of minced green chillies, ginger and chopped dhaniya patta. Khameeri roti is the best accompaniment the paya shorba can get. The test of a good paya shorba is in the consistency of the gravy when it cools down. It becomes a jelly once at room temperature and in winters it starts jelling even on your plate and the fingers start feeling sticky due to the gelatin rich gravy. We normally eat this over 2-3 days once cooked on the weekend. In winters this is the one of the best comforting foods to have. Very nourishing, great for convalescence and for lactating mothers. Like liver curries I have been experimenting with paya shorba a lot these days. With advancing age we understand the utility of some of these foods better and start overcoming the inhibitions we had regarding some of the boring foods or some of these time consuming foods too. Paya shorba is well worth the time it takes. Do not forget some good yeasted flat bread with it, or a home baked khameeri roti if you can. Please don't ever ever take your blog off the net. What will we do when we need to look up traditional recipes which we have never learned before, but increasingly feel the need to cook now? Thanks for sharing this recipe. I think any roti or naan would go great with it. Its sounding so so delicious!!! Am back after a looong hiatus from blogging and am looking forward to catching up on your posts and all the lovely food you have been cooking up.The dish looks yummy!